We had an almighty cold front crossing over us the entire weekend. 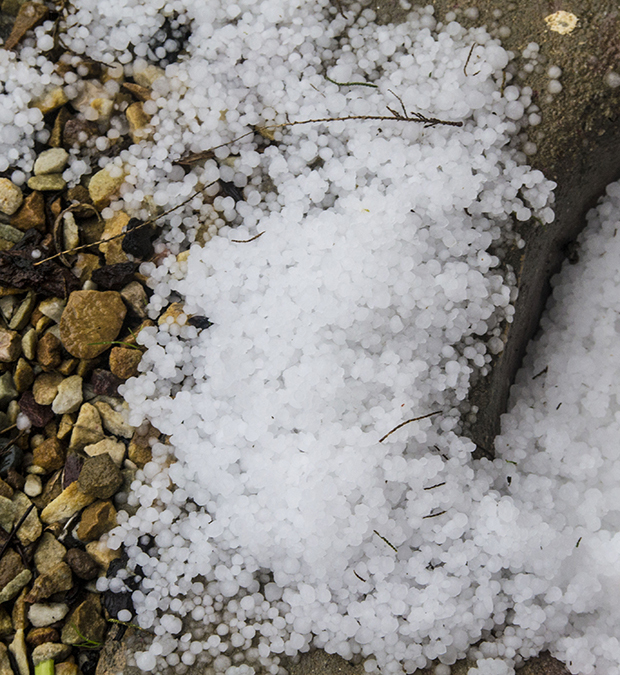 And the hail storm that exploded just a few hours ago was amazing! I haven’t experienced one like this before – not that I can remember! We have a zinc roof so the noise was deafening. 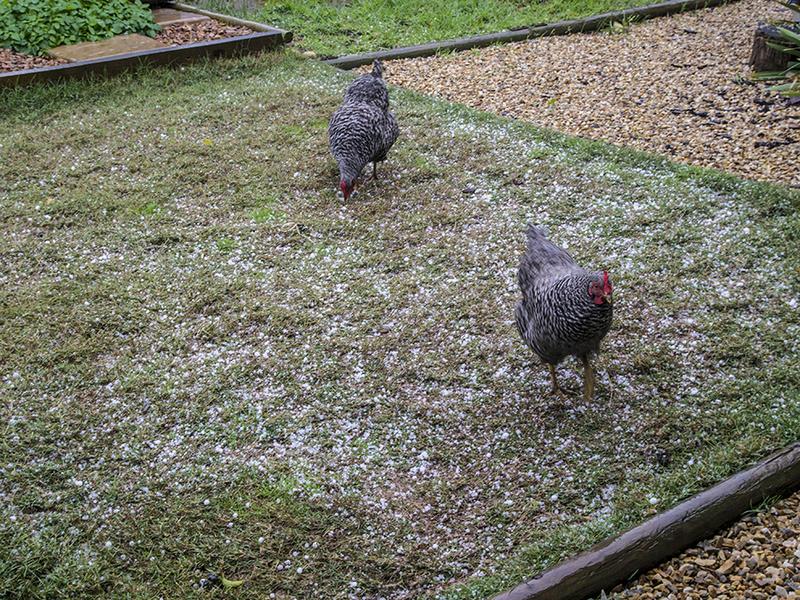 I was so surprised to see the new chickens, Tara and Rocky, running around and picking up balls of hail! How funny is that!! They seem to have no fear! 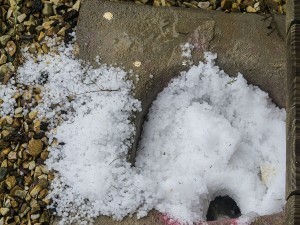 The amount of hail that fell can bee seen in the mound that landed in the drains! Well, the Cape of Storms has lived up to her name!! Winter has truly settled in. Let’s get the soup on the stove, the blankies out and the wood in the fireplace! The Girls are chasing hail stones! 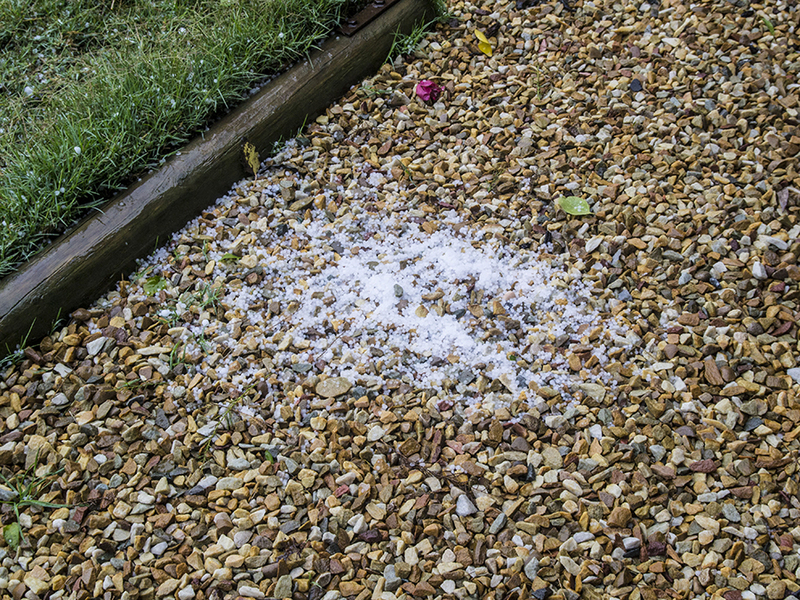 The simple fun of chasing hail stones! I love the photos of the chickens picking up the hail. It must have amazed them and was like a frosty treat. 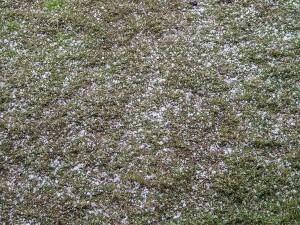 I love that your hens were foraging for hail! Too cute! 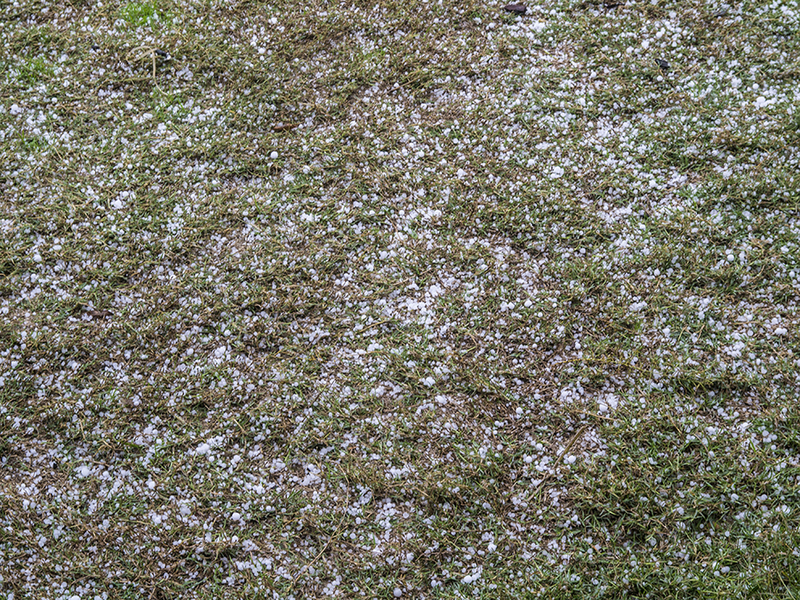 Sorry about the hail though. Our barn has a metal roof, and you can hardly hear yourself think even when it rains! We do too!! I had to shout to be heard! It was an unusual event! Barbara, That hail storm was really something. You would think that chickens would have more sense. We have been having severe storms here all spring…hail has missed the garden thankfully so far…as the seasons change to winter for you I hope you can enjoy some rest. Thanks Donna – I am leaving the garden for the new chickens to work. I know they have other intensions and will scratch everything up, but I will be re-planning the back garden to be more chicken hardy! My kids picked up a bucket full of hail in my veggie garden yesterday. i wonder how the plants will be affected by this cold? The weather pattens are really changing, so we have to adapt with it, I guess! My garden saw no damage at all – except for the chickens scratching it up! Happy Winter, indeed! The girls must be wonderful entertainment. 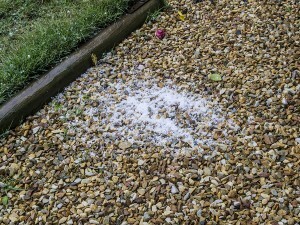 Good thing the hail wasn’t bigger! Oh yes!! We had no garden damage! But I will have to re-design the back garden soon to make it chicken-hardy! Thank you my lovely and beautiful daughter!! we too, bits of our garden look as if it’s been SNOWed on. And COLD!! Hi Diana – did you see the photos of Cape Town?? It was a winer wonderland!